The Northern Ireland sun struggled to penetrate through the clouds, stopping just short of the rusty bus with a sigh of regret, as though too tired to continue any farther. As the vehicle made its way down the dirt path, I clung to my seat with one hand, the other holding a book, trying to ignore the bumping and rattling. The book in question was leather-bound and faded, containing many different myths within its worn pages. It had been a gift from my grandmother, and I treasured it greatly. "Ah missy, do ye like legends?" the bus driver asked in a strong Irish accent as he glanced back at me through the tarnished rear-view mirror. 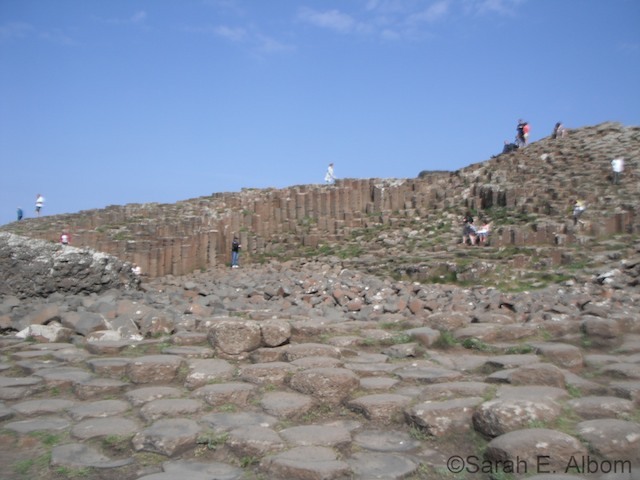 "I know a legend about the Giant's Causeway, and I can tell ye before we arrive there." I nodded, gently closing the worn pages and holding the book in my lap as the man began, apparently taking no notice of how the bus was behaving like a particularly jumpy jack-in-the-box. 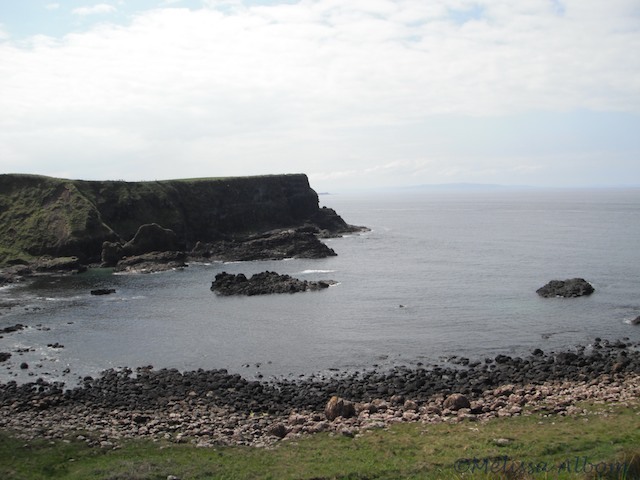 "They say that the causeway was built by a giant named Finn McCool, who wanted to win a fight against the Scottish giant, Benandonner. Well, he got over there an' when he realized how big Benandonner was, he ran back to Ireland an' his wife Sadhbh disguised him as a baby. Benandonner came over, an' asked Sadhbh where Finn McCool was. When Sadhbh told 'im she didn't know, Benandonner got angry. However, Sadhbh scolded 'im for yelling because she didn't want the baby to wake. Benadonner hadn't noticed Finn McCool disguised as a baby before, but when he did he decided that if babies were that big, Finn McCool must be huge. He ran back to Scotland, tearing up the bridge as he went"
Thanking him, I stared out the salt-stained window, clutching my book as we were jolted over another bump in the road to stop it from flying across the aisle. 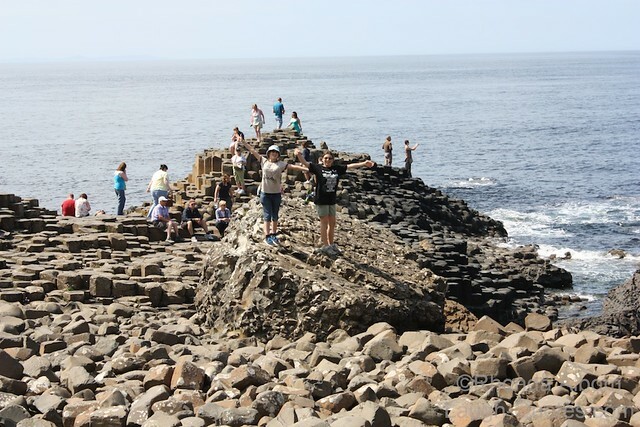 Though it would be impossible to take pictures of anything through the sea salt and grime, it was clean enough to see the towers of rock that made the Giant's Causeway, stretching out in a broken bridge towards the sea. The dark stone contrasted against the ashen sky like a chessboard made of the elements, but far out, on the horizon, there was a patch of darkness. I squinted, pressing my face against the cool glass I struggled to make out the man-like shape. Then, I banged my head against the glass as the bus jerked to a halt with a screech. Rubbing my sore head, I piled out with the rest of the passengers. The visitors with cameras were frowning at the grey sky, for although it was springtime, Ireland seemed to only have two types of weather - overcast or rainy. Carefully following my family, I grasped the worn leather cover firmly and watched every step I took on the vertical pillars of basalt. Hardly graceful at the best of times, I could already imagine my backside being introduced to the stone in a rather undignified way. I couldn’t help but continue to glance at the twilight patch as we made our way across the smooth stones. As my sister posed for a picture, I inched towards dad. “What do you think that is?” I asked, pointing towards the ominous cloud in question. Dad scanned the horizon, and then turned toward me, a puzzled frown across his face. “There’s nothing there,” he replied gently, before moving away. I stood alone on an isolated out-jut of columns, waves splashing against the stones at my feet as I stared at the very obvious dark patch in the sky. I could hear shouts from behind me as I looked out. Just as I was turning away, my shoes lost the little grip they had. With a spectacular flailing of arms, I landed on the rock, dropping my book in the process. It teetered on the very edge of the rocks. I dived for it and my hands scrabbled against the edge of the bound paper, before it gave in to gravity and fell into the ocean. I stared, thunderstruck, as my treasure sunk into the watery depths of the Atlantic Ocean. As though to taunt me, a wave crashed against the stones and flew up, dousing me in icy spray. Sputtering, I rubbed my eyes, and then looked around in confusion. The world had become silent apart from the crashing of waves, and I was alone on the stone pillars. Despite my confusion, haze clouded my mind and I felt a curious peace settle softly on my shoulders, like the moment before dreams come to whisk me away from reality. I stood, wringing out my clothes as my gaze rested upon the darkness on the horizon. What was it? “It is the giant Benadonner,” a weathered voice informed from beside me. Whirling toward the noise, I warily observed the only other person on the rocks, an ancient man who had snuck up on me without a sound. He wore bright green garb and had a lined face, which must have had more wrinkles than there were scales on a dragon. “Who are you?” I asked aloud, my voice echoing in the silence. The man smiled as he leaned on a gnarled stick. I realized in shock that his clothing was made from fresh leaves, sewn together with grass. “Uh...” I trailed off. Despite it being the least of my concerns, I asked, “did you say you work for an elf?” Ailfrid ignored my question. “That’s a... giant?” I trailed off once again, as the darkness faded away until there was only grey in the sky. “For now, he is gone,” Ailfrid wheezed, “but he will return, along with many others. This island is the root of many legends, and from here they will come forth.” Slowly, he backed away from me, towards the water. "I believe it is time for you to return to your family. Farewell, child, and I hope we meet again." “Time to go!” I heard dad's voice, as well as countless others. I turned around to see him and the rest of my family walking back over the rocks, towards a waiting bus. When I looked towards the oracle again, there was nothing but air where he stood. Confused, I numbly started to follow my family over the columns, away from the ocean, but a voice stopped me. Turning around yet again, I found an elegant, golden-haired maiden standing where the oracle had been a moment before. She smiled, and handed me a familiar book, which was completely dry. "I believe you will be needing this," she told me as I ran my hands across the leather binding, her voice carrying across the wind on silver wings. Then she was gone, and I wondered if I had dreamed the entire encounter.